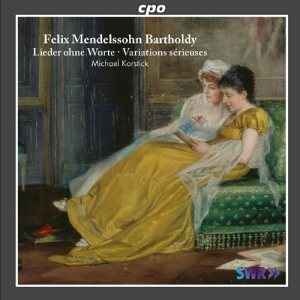 Mendelssohn’s complete eight sets of Lieder ohne Worte (Songs without Words), each comprising six songs, are featured here. They are presented in chronological order of composition, and are excellently performed by Cologne-born pianist, Michael Korstick. Korstick - who has recorded extensively for CPO - specialises in romantic music, and is clearly completely at home in this repertoire. The first disc opens with the Variations Sérieuses, which immediately reassures: one is in the hands of a pianist who knows and understands the music intimately and is well able to communicate it. In particular, Korstick achieves a good clarity of sound and voicing throughout the two discs - the shaping of phrases is also pleasingly subtle. The changes of colour that he employs between the works is convincing (for example between No. 5 (piano agitato) and No. 6 (Andante sostenuto) of the Sechs Lieder ohne Worte op. 19b; or between the more devotional No. 3 (Adagio non troppo) and No. 4 (Agitato e con fuoco) of the op. 30 set, with its Schubertian agitation. Korstick also brings out the architecture of the works well, and shows effective use of agogic accents and slight fluctuations of tempo to add weight to phrases and as a means of appropriate expression. Listen, for example, to No. 3 (Presto agitato) of the fourth set, op. 53. Another impressive feature is Korstick’s good solidity of tone where appropriate: for this, listen to No. 5 (Allegro con fuoco / Folksong / Chanson Populaire), again in the op. 53 set. The two disc set is handsomely presented, with interesting, well-written and informative notes by Thomas Bottger - for once with an English translation that is readable and idiomatic! This is a disc that I cannot fault at all - highly desirable.